The first day of November signifies the start of the cold-weather holiday season: a period characterized by fluffy sweaters, seasonal tunes, and of course, countless opportunities to stuff your face in the name of celebration. For college students, this post-Halloween period also marks the second half of the semester, bringing an onslaught of midterm exams (in addition to candy and hangovers). Whether you’re stress-stricken or imbibed with holiday cheer this November, you are probably finding more excuses to snack in between meals than to venture from the warmth of your dorm to FitRec. Perhaps your waistline and/or ability to combat seasonal depression have suffered as a result. But fear not! I am here to tell you that it is possible to celebrate the season AND snack smart in the comfort of your own home or home-away-from-home. 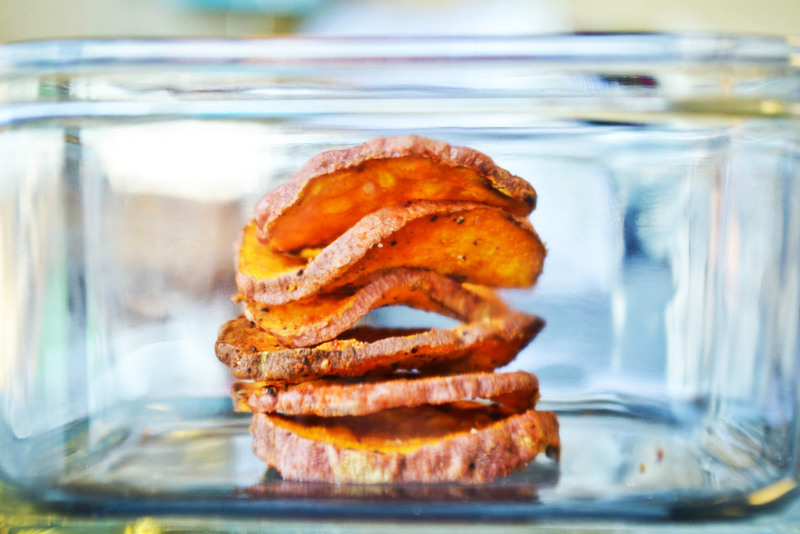 Behold: microwave sweet potato chips in six minutes or less. All you’ll need to do is pick up one sweet potato (or more!) on your next trip to Shaw’s. For around 69 cents, you can have a sweet, salty, portion-controlled snack next time you need a study-break. The recipe calls for olive oil, salt, pepper, and any other spices you might like. If you live in a residence hall and fear a grease fire, you may want to consider nixing the olive oil altogether; I found that it did not add too much flavor. The salt, pepper and spices, on the other hand, are what make the chips snack-worthy. If you don’t have any on hand or don’t want to buy them, you can pick up some individual S&P packets next time you’re at Cane’s or Chipotle. I used smoked paprika. Although I don’t have a kitchen, its complex flavor is a welcome addition to any dorm dish; here, it provided a mesquite BBQ quality to the naturally sweet chip. Spread the sweet potato slices in a single layer on either a paper-towel or paper plate covered in a paper towel. Do not cook on just a paper plate—it will burn. Flip the chips every two minutes (until they curl at the edges and make the room smell like autumn). Cook time will vary depending on the thickness of the chip and the power of the microwave, so keep a close watch on your chips even in the early stages of microwaving. If you do not want carbonized chips, keep your eyes glued to the inside of the microwave. They turn from orange to black in a matter of seconds. Desired amounts of salt pepper, smoked paprika, or any other spices you like! Slice potato as thinly and evenly as possible. Lay potato slices in single layer on paper towel in microwave, season with spices to taste. WARNING: large clumps of paprika tend to burn, so be careful. Cook on high (or express mode) in 2-minute increments, turning each time until crispy but not burnt. Smaller chips may start to darken, so remove as necessary.